Earlier in the year Andy and I got the opportunity of a weekend staycation at Baby Elephant Boutique Hotel in Siem Reap, Cambodia. Due to work and travel commitments, we had to change our booking a couple of times, but this turned out for the best as the rearranged dates coincided nicely with my birthday weekend. Having previously visited Baby Elephant Boutique to use their swimming pool I knew we were in for a treat, so was justifiably excited. Baby Elephant Boutique Hotel provided us with a complimentary two-night stay which I’ve reviewed below. Read more in our full Product Review Disclosure. Founded in 2015 by Australian couple Ilana and Adam, Baby Elephant Boutique Hotel is a tranquil sophisticated haven with 25 comfortable, stylish rooms. Tucked away down a quiet back street off Angkor Night Market Street, it’s only a quick tuk tuk ride from the chaotic Pub Street and bustling Night Market. This means you have the best of both worlds – proximity to central Siem Reap, but peace and quiet when you need to rest and recuperate. As we live in Siem Reap, Andy and I made our own way to Baby Elephant by tuk tuk on the Friday afternoon of my birthday weekend. 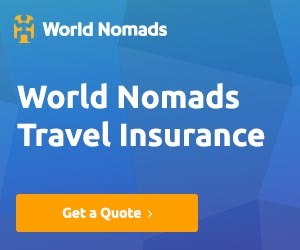 However, if you’re arriving from somewhere else by bus or plane a complimentary tuk tuk pick-up can be arranged for you, taking the hassle out of finding your own way there! No sooner had we jumped out of our tuk tuk than we were met by a beaming member of staff in a brightly coloured tropical print shirt. With palms pressed together in front of him, he bowed slightly in the traditional Cambodian greeting called Sampeah. He led us through the gates and down a path lined with palms and other greenery to the bright reception area. We were handed a welcome drink and cold, lemongrass scented wet towels to freshen up our hands and face. Within minutes we’d been checked in and escorted up to our room on the second floor of the hotel; another staff member followed close behind with our bags. Baby Elephant has seven room types with the original 13 in the main building and another 12 new rooms in an adjacent wing. Prices range from $38.18 USD (£28.41 GBP) for a Budget Twin room up to $81.27 USD (£60.46) for a Premier Double room which we were lucky enough to stay in. We were both very impressed upon entering our spacious, well set out, air-conditioned room. It was tastefully decorated in black, white, and grey with the odd pop of colour from bright cushions and a locally produced floral painting. Just inside the room was a seating area was a coffee table and sofa, perfect for relaxing on whilst watching the flat screen television. The huge, comfortable bed was beautifully decorated with two elephants created skillfully from folded towels and flanked with two bedside tables and a small wooden bench. Set in an alcove under the window was a writing desk, topped with complimentary tea and coffee making facilities and bottled filter water. To the right of this was an electric safe and well-stocked mini-bar. Just as we were about to look around the rest of the room there was a knock at the door and a member of staff presented us with a complimentary fresh tropical fruit basket. A really nice touch! Wooden slats gave a partial wall between the bathroom and living and sleeping areas. Directly behind this was a big white sink with grey marble surround, leading from this was a large combined shower-room and toilet, again done out in grey marble. Toiletries and hairdryer were provided along with fluffy white slippers and bathrobes. There was also a wardrobe and storage area with plenty of space if you wanted to unpack your clothes. Our room had everything we could possibly have wanted and needed for a very comfortable stay. As soon as we’d settled into our room we donned our swim stuff and headed straight down to the swimming pool. Baby Elephant has a beautiful sparkling blue saltwater pool set amongst an oasis of leafy green plants and flowers. Sunbeds and small tables line one edge and at the far end is a seating area with more tables. I chilled out near the pool and caught up with some social media (they have high-speed wifi), as a badly timed new tattoo the previous weekend meant couldn’t get in the water. Andy, on the other hand, wallowed in the pool until he’d turned as wrinkly as a prune. During the afternoon we ordered a couple of drinks and some French Fries from the bar. Unfortunately, we weren’t hungry enough to try any of the other delicious looking dishes on the menu. The swimming pool at Baby Elephant was definitely one of our favourite swimming pools in Siem Reap we visited whilst living there. At the end of our first day at Baby Elephant after a quick freshen up and change of clothes we headed back downstairs to the newly renovated bar for happy hour cocktails. 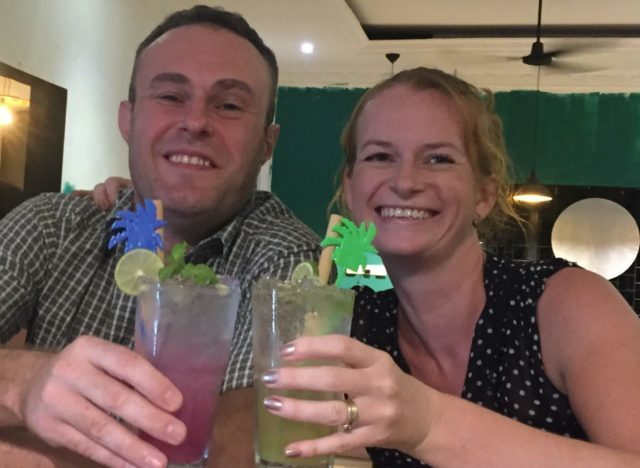 There’s an expansive, inventive, and delicious cocktail and mocktail menu which between 5 pm and 7 pm every day is two-for-one. We joined Ilana, a few friends and some other guests at the bar and indulged in a few of their fantastic creations. I mean how could we resist, it was my birthday weekend after all! For those of you who don’t like cocktails, draft beer is just $1 USD (£0.74) all day every day and there’s also a good selection of other beers, wines, spirits, and soft drinks. The great drinks, friendly staff, colourful decor, and music create the perfect atmosphere for some early evening (and maybe later) socialising. We didn’t get chance to sample any main meals from the menu as we were out and about doing birthday things, however, we did see plenty of tasty dishes being served to other guests. The menu had a wide selection reasonably priced International and Cambodian (Khmer) dishes including vegan, vegetarian and gluten-free options. Since we visited the food and drinks menu has also been revamped so you can expect a delicious array of new dishes to choose from. Although we didn’t eat a full main meal at the hotel we did sample some bar snacks on Saturday night, Crispy Chicken Wings and Grilled Honey Glazed Pork Ribs. $5.50 USD (£4.09) and $6.00 USD (£4.46) respectively. They were both really good! One meal we were sure not to miss out on was breakfast on the Saturday and Sunday mornings. 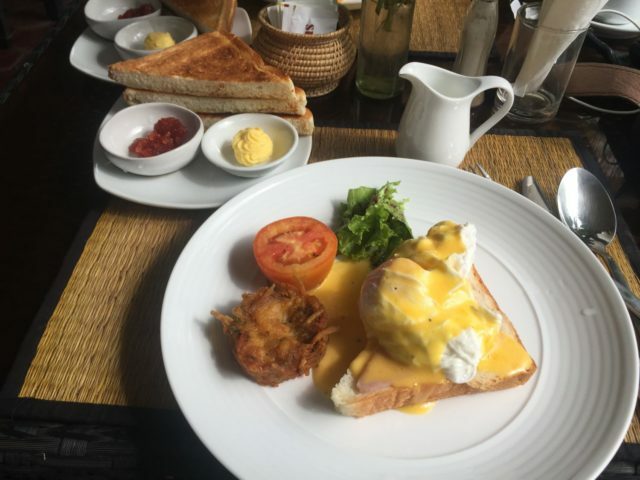 Included in the room rate for all guests is an a la carte Western or Asian breakfast, we both went for Eggs Benedict one day and Eggs Your Way the second day. Both were delicious and also came with a bowl of fresh fruit, tea or coffee, and juice – a great start to the day. On the Saturday of our stay, I woke up to a lovely surprise. One of my friends back home had been in contact with Ilana at Baby Elephant and arranged for myself and Andy to take a Cambodian Cooking Class with Head Chef Hoya. The class itself was about three hours long plus the time it took us to enjoy what we’d cooked at the end. We started out with a trip to Old Market in the centre of Siem Reap with Chef Hoya to buy the ingredients. Then it was back to Baby Elephant to don aprons and chefs hats and get cooking in the lovely garden. We made Green Mango Salad with Fresh Prawn and Smoked Fish, Cambodian Yellow Chicken Curry and Nom Plae Ai – a traditional dessert (Sticky Rice Ball with Palm Sugar Centre). The lesson was very hands-on and interactive; Chef Hoya knew his stuff, was extremely friendly and spoke great English. Sporting a wonderful sense of humour, he was also more than happy to be filmed for an episode on Andy’s YouTube Channel about our cooking class and stay at Baby Elephant Boutique Hotel, which gives lots more details of our experience. Once we’d finished cooking and cleaned up we got the chance to sit in the lovely pagoda to enjoy our meal. It was pretty good if I may say so myself. 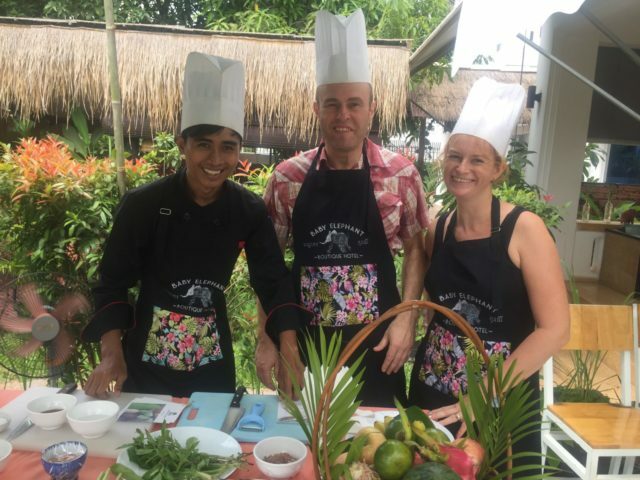 A Cambodian cooking class at Baby Elephant costs $23 USD (£17.11) or $25 USD (£18.60) depending on numbers; there are three menu options, one which is vegan. Baby Elephant Boutique has several other facilities and services that we sadly didn’t get around to trying out. These include: Lemongrass Garden Spa – offering traditional Cambodian massages, and other health and beauty treatments. These are all carried out by a professional, fully trained team. Gym and Yoga – on the second floor roof-top area with a 180-degree view is a breezy space where regular yoga sessions take place with passionate, professional instructors. Artists in Residence – Silversmiths In My Name Silver and artist Tamara Venn are the first artists in residence at Baby Elephant. In My Name runs silversmith workshops and also takes commissions for gorgeous jewellery designed and created based on Khmer words. Tamara Venn painted the stunning wall mural in the garden restaurant along with other pieces of art that are dotted about the hotel. She also has pieces for sale on-site. Bicycle Rental – Baby Elephant stock rental bicycles supplied by White Bicycles, a not-for-profit organisation raising funds for local charities. These can be rented for $2 USD (£1.49) per day. 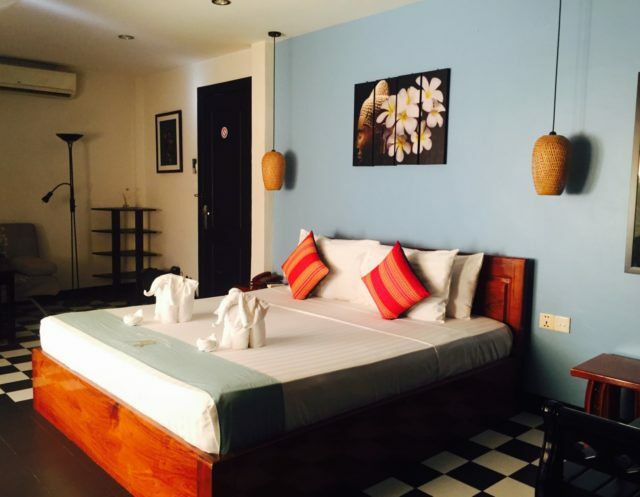 Tours and Activities – if you need help organising any type of tour or activity in Siem Reap the reception staff at Baby Elephant will be happy to oblige. From a tuk tuk or taxi tour around the temples or countryside, information on alternative activities in Siem Reap or onward transportation nothing is too much trouble. 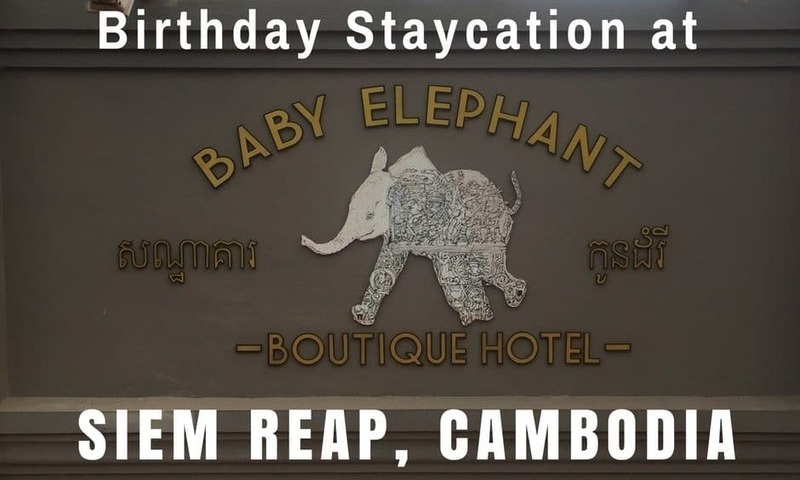 I had a feeling we were going to enjoy my birthday staycation at Baby Elephant Boutique Hotel, but it surpassed all my expectations. We both had a lovely time and the atmosphere and friendliness of the managers and all the staff made it feel like a home from home. There was one final surprise just before we left on the morning of my Birthday. Several members of staff bought be a birthday pancake with candles to our room and sang Happy Birthday to me. Yet another lovely touch where they went the extra mile. A thoroughly relaxing, fun and enjoyable weekend. 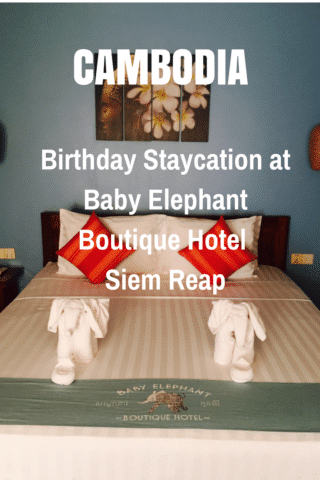 We had a fantastic time at Baby Elephant Boutique Hotel and would encourage anyone visiting Siem Reap to book a stay with them!